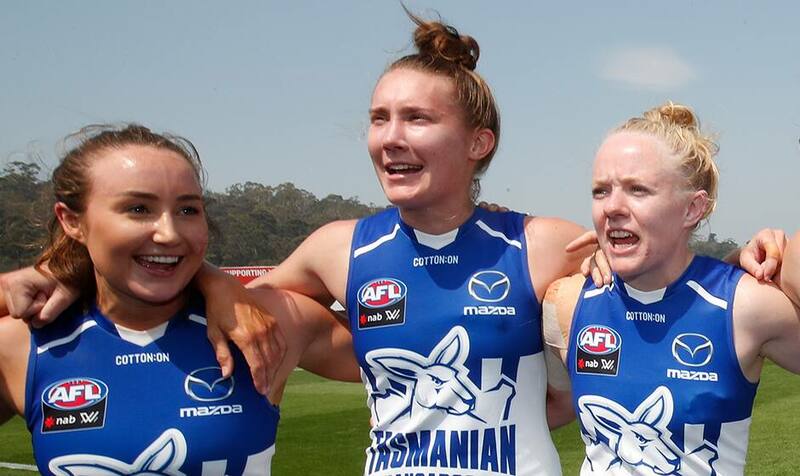 Singing the club song after your debut game seems like the perfect start to an AFL Women's career, but North Melbourne's Nicole Bresnehan admitted to struggling a tad with the lyrics in the wake of her side's impressive 36-point win over Carlton in Hobart. "A win was just fantastic and being out there in front of a home crowd was phenomenal," the 21-year-old Clarence Football Club product said. "I was caught out there, and I do need to learn the words a bit better," she said with a laugh. "That will have to definitely happen outside of training during the week." While high-profile recruits such as Emma Kearney and Emma King may have demanded plenty of attention following their off-season moves to North Melbourne, Bresnehan and fellow Tasmanians Brittany Gibson and Emma Humphries also earned plenty of praise from coach Scott Gowans. Gowans was clearly thrilled with the output from Kearney (18 disposals and five tackles) and King (two goals, 16 hit-outs and seven tackles), but saved a special mention for 21-year-old Bresnehan after a few eye-catching moments on debut. "Nicole is one of those players … she is going to be a superstar," Gowans said. "Her learning, her ability to learn and her thirst for knowledge is incredible, and it's no surprise she performed well because she puts so much into her game off-field." Gowans believes there's enough to like about Bresnehan's game that she can definitely push into the midfield in the future, a prospect Bresnehan says she would relish. "Playing the midfield would definitely be great," she said. "I love to run and I love a bit of physicality, but I think my best position at the moment is across the wing or across half-back. I'll just slot in anywhere the team needs." The Kangaroos travel to Drummoyne Oval in Sydney on Friday to take on Greater Western Sydney, which will be seeking its first win after a narrow loss to Brisbane last weekend.